INDY - Animal Amour, Inc. 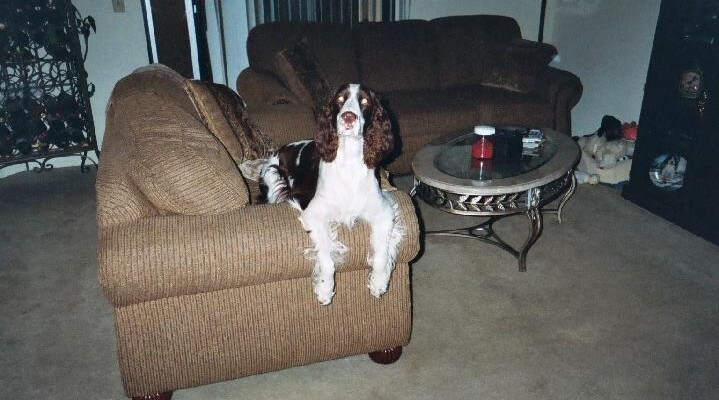 I have a 2 year old female, English Springer Spaniel named Indy. She is absolutely my pride and joy. I recently took a job that I love very much but it required me to travel and I had a lot of reservations about leaving my baby. My first business trip, I left Indy with a friend thinking she would be just fine. Upon my return, Indy seemed very stressed, upset and was not feeling well at all. Before I decided to change jobs (which I would do for my dog) I searched the web and found: AnimalAmour (Joni). I figured that if I kept Indy in her home, with her stuff and just had someone come visit and play with her throughout the day, that would be better that taking her somewhere unfamiliar and leaving her for a few days. I am extremely happy (and so is Indy) that I found Joni. Indy and Joni hit it off immediately at first meeting. I could tell from day one, that Joni was a dependable, conscientious and caring animal lover. On my next business trip, I hired Joni to visit and walk Indy 3 times a day. Although I worried on that trip, when I returned I realized that I had no need to. Indy was very happy and healthy and seemed to behave as if I just had left for the grocery store. Joni has added a very special touch, which I love very much. She keeps a journal of her and Indy’s activities each day. This gives me piece of mind knowing when Indy is eating, when she is going potty and her behavior and disposition each day. I love to return home from my trips to my very happy, healthy dog and read about how her days were filled fun and love while I’ve been gone. I have decided to keep my job knowing I have such a great pet sitter. Joni is great with Indy and a wonderful person also. Indy and I hope to be friends with her for a long time. I highly recommend AnamalAmour to anyone that stresses or worries about leaving their pets.